Even with a much warmer winter than normal in my neck of the woods, it is still soup season! 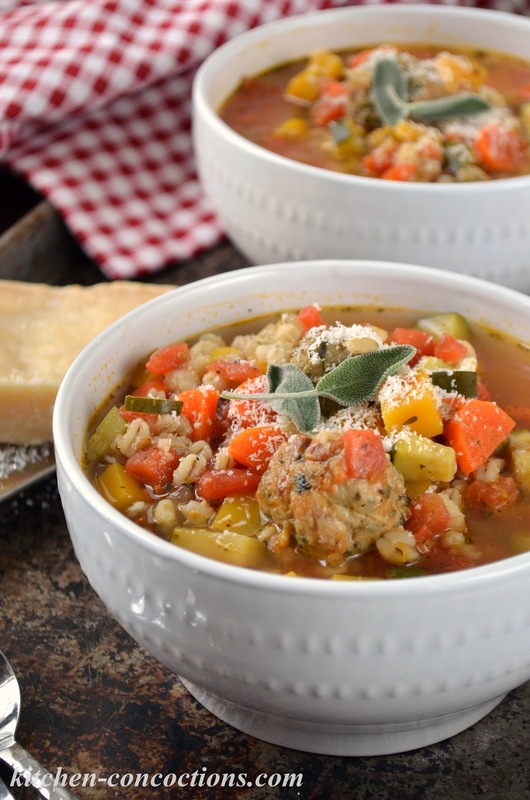 Whip up a big batch of this hearty and healthy Vegetable Barley Soup with Chicken Sausage Meatballs on this cool(er) February night! I would give anything for a big bowl of this soup at this exact moment. Actually I would give anything for a home cooked meal. For the past month, I have barely kept my head above water. I have been workin’ like crazy at my “day job(s)” and traveling quite a bit. Then I decided that life wasn’t crazy enough right now. To shake things up even more, I decided I should move right in the middle of it all. Needless to say, cooking, well it hasn’t existed, for let’s be real… weeks (maybe a month?). Obviously when I have been out of town it has been meals out on the town. And considering all of my dishes, pots and pans have been carefully not so carefully (because who has time to pack properly, not I) in boxes for going on 12 days… more eating out, or sandwiches for breakfast, lunch and dinner. Which is all fantastic… for when I can unpack and find my ice cream maker… priorities at it’s finest (have I mentioned I’ve been stressed.)! I haven’t quite decided what our first home cooked meal will be in our new home, but this soup is so comforting and welcoming, that I am leaning towards it! 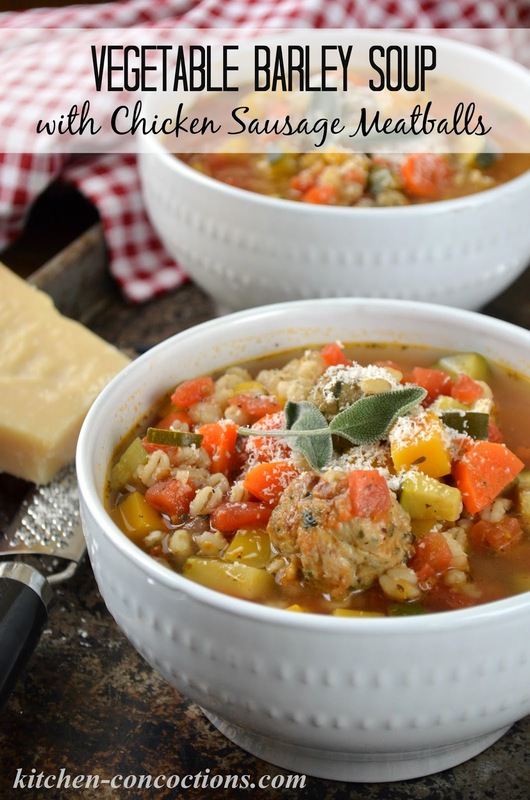 I have been making this Vegetable Barley Soup with Chicken Sausage Meatballs all “winter” (if you want to call it that… more like a cold Texas spring) and it has quickly become a favorite! Since it is loaded with vegetables, chewy barley and plump, juicy meatballs; makes it not only delicious but good for you too! Now… since I am drowning in a sea of boxes… what is your best tip for quickly getting settled into a new house? Err… that should read: SEND HELP! 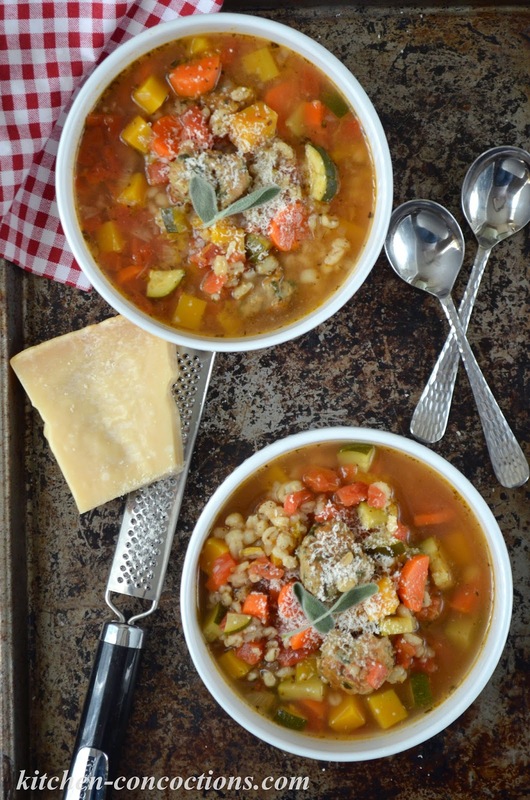 A hearty, good for you soup loaded with vegetables, barley and sausage meatballs. Remove sausage from the casing and place in a large bowl. Using a tablespoon or cookie scoop, scoop sausage into small meatballs; using hands to roll into uniform meatballs, if needed. Heat olive oil in large pot over medium heat. Working in batches, add meatballs and brown on all sides. Using a slotted spoon, transfer meatballs to a paper towel lined plate and set aside. 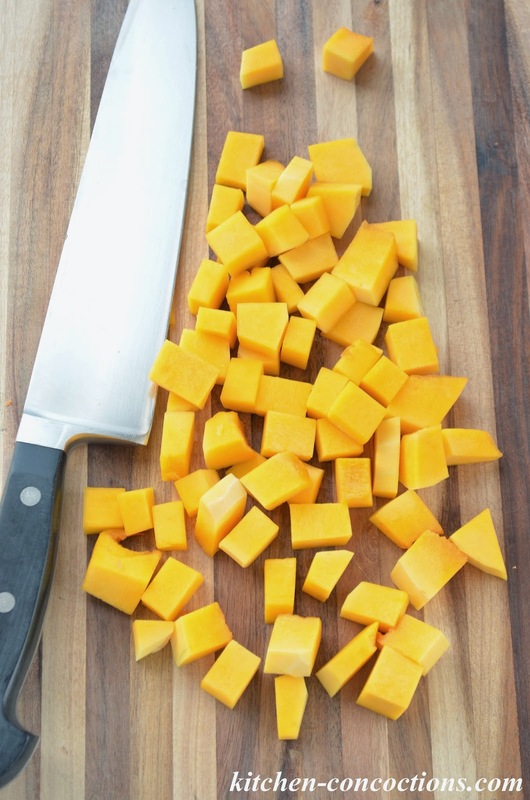 To the same pot add onions, carrots, and butternut squash and saute for for 5-6 minutes, adding additional oil, if needed. Add the garlic and cook for additional 1-2 minutes. Stir in chicken broth, diced tomatoes, seasonings and barley. Bring to boil and boil for 3-5 minutes. Reduce heat to simmer and add browned meatballs. 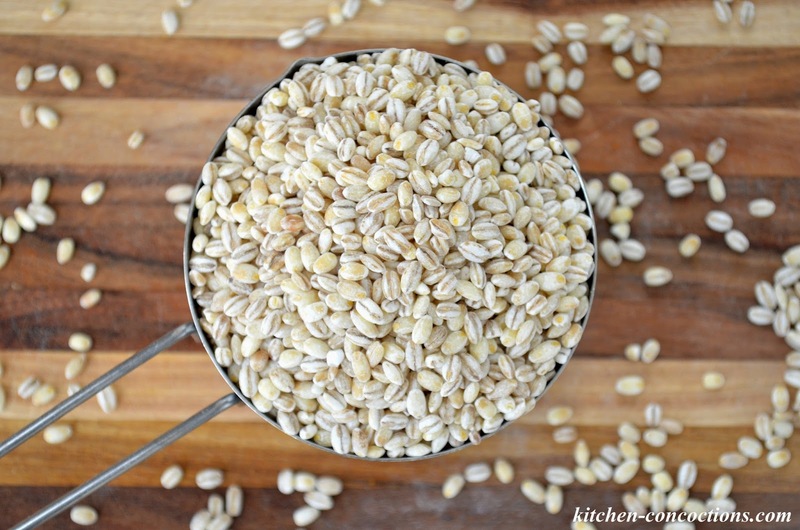 Cook 30-45 minutes or until pearl barley is tender, yet slightly chewy. During the last 15 minutes of cooking, stir in zucchini. Ladle into bowls and serve with grated Parmesan cheese, if desired. *Note: Can be omitted for a vegan/vegetarian meal. Serving Suggestion: Serve with dinner rolls and a side salad.